We are one of leading manufacturers and exporters of a wide range of finest quality of Contra Rotary Mixers, used in mixing the high density and viscosity materials like grease, toothpaste and other viscous products. The product is designed in way that it ensures homogeneous mixing of materials, no air contamination in mixing and minimum loss of residual of raw material. We offer the entire range at much genuine prices. We offer an extensive assortment of superior quality of Contra Rotary Mixer, manufactured from finest quality of raw materials. The product range is specially designed in compliance with set international and national quality standards. The product is widely acknowledged fro its varied features like uniform mixing of high viscous materials, durability, sturdy design and smooth functionality. Contra Rotaiy Mixer is an ideal mixer for the product of high viscosity density. lt is suitable for thorough mixing/ blending of tooth paste, grease otherviscous compounds. The mixer consists of two different blades rotating clockwise and anti clock wise simultaneously. It consists of two different shafts, one being solid and the other hollow. The solid shaft is provided with multiple paddle blades, which rotate in clock wise direction while the hollow shaft with anchor scrapper blade assembly rotates in anti clock wise direction. lnbuilt homogenizer with mechanical seal is provided with the bottom dished end for emulsification. lt is a chopper type high shear emulsifier. The high shear action creates a forced product ﬂow. Aseparate control panel with MIMIC. Specially designed pressure plate with double grooved ‘O’ rings for discharging high viscous pastes by hydraulic system with power pack unit for smaller version of contra rotary mixer. Water heating system or thermal fluid (oil) heating system can be provided for smaller units. The Laboratory model of Contra mixer with Homogenizer, is also available in batch size of 20 to 50 Ltrs. The Lab Model units are available for bench mounting or they are supplied on stainless steel trolleys. Vacuum pump, heating system, etc., can be provided as optional accessories. Jacketed mixers are provided for heating of products during mixing. 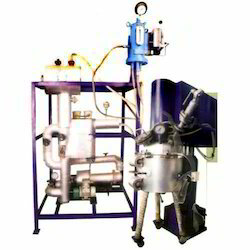 Provision to mix / blend the viscous products under vacuum for de-aeration purpose. High shearing action because of contra rotary motion homogenizer. Anchor blade assembly with adjustable Teﬂon scrappers is provided to avoid localized heating ensure uniform mixing. Top drive agitator assembly can be lifted lowered by motorized as well as hydraulic operations if required. Smaller version of Contra Rotary Mixers is provided with lifting arrangement for the bowl instead of top drive agitator assembly. Pneumatic system is also available for lifting lowering top drive agitator assembly for smaller version of Contra Mixer. Looking for Contra Rotary Mixers ?